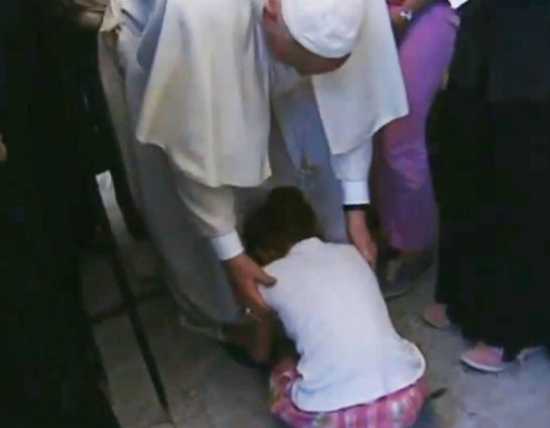 A video showing a young girl prostrating herself at the feet of Pope Francis in a refugee camp is stirring anger among Arabs and Muslims across social media. They’re denouncing the scene as humiliating for Muslims and criticizing leaders in the Middle East for abandoning refugees. The video was taken during the pope’s Saturday visit to the Moria refugee camp on the Greek Island of Lesbos, where 3,000 migrants face threats of deportation under a newly-implemented deal between the E.U. and Turkey. While he was meeting refugees at the detention center, a young girl dressed in pink and white approached him, knelt down and kissed his feet until he lifted her up by her shoulders. She was crying. Posts with the video, which many said showed a Syrian girl, went viral across Twitter and Facebook, drawing a surge of comments from people also posting the hashtag #SyrianGirlKneelingInFrontTheVaticanPope, Vocativ discovered. Many were ashamed and humiliated by the symbolic scene, since it allegedly showed a girl from a country with a Muslim majority at the feet of a Christian leader, and was a clear example of the desperation felt by so many Syrian refugees. Many blamed Arab leaders for the humiliation, saying refugees were abandoned by the Arabs and Turkish President Recep Tayyip Erdogan, since he signed a deal with the E.U. saying asylum seekers who make it to Greece can be returned to Turkey if they don’t qualify or apply for asylum. Another social media user criticized the Arab Gulf states “who abandoned the Sunnis in Syria and Iraq at the hands of the Shiite and didn’t open the asylum gates” for refugees—an attack on how little Gulf states have done to even consider admitting Syrian refugees.